I’d like to describe “sameplane” as based on a transformational flight back before the Internet existed. As it happened, I shared the same plane with the famous media theorist Marshall McLuhan. His prediction of the Internet – where all of humanity could digitally connect and create – blew my mind, and inspired me toward a media career. Well, my luck and timing do not align with a McLuhan encounter (he passed away in 1980). And I didn’t intend a fictional blog (maybe someday, about dragons or Hello Kitty art). 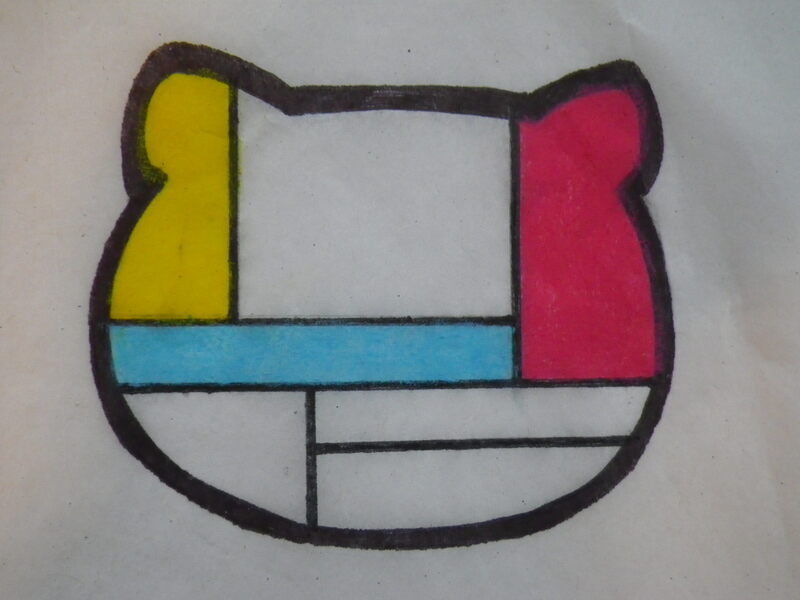 Hello Kitty with Mondrian planes – a project sketch from my studio. The real explanation goes back to my consulting experiences and media research, which simplified my view of new media for strategic communication. Media constantly changes many aspects of our lives, forcing us to keep pace the best we can with digital, social and mobile media. This pace can be exciting, challenging or bizarre depending on the day. Yet, as McLuhan noted about humans, “We’re always living a way ahead of our thinking.” Our minds continually are playing catch-up. Ultimately in strategic communication we try to connect with our audiences by sharing a way of thinking, or same plane of perspective. Adding new media to the equation means understanding many new media tools, which humans use with different attitudes, motivations and behaviors. But essential is that same plane of thinking – creative potential follows for meaningful, powerful and even cosmic outcomes. This “sameplane” thinking has guided my career as a corporate communicator, marketing consultant and web strategist – a career that grew up alongside the Internet thanks to years in high-tech (go way back, like AOL dial-up days, Cluetrain Manifesto). Now as a professor and researcher, I still rely on this thinking to share perspective for my students and studies. Look around for that same plane. The notion inspires modern geometric fashion design thanks to digital technology, planetary orbits in Science Magazine and hours of interesting reading about planes on Wikipedia. How do you align your thinking with others via new media? How do you view their attitudes and behaviors? What would you have asked Marshall McLuhan on that same plane? This entry was posted in Creativity, Sameplane and tagged mcluhan, new media, sameplane, strategic communication on February 11, 2013 by admin.